Well it’s that time of year again. What are you thankful for? Mr.C, the juniors (including new daughter in law) Family, friends and my 3 cats and the dog. A very small pay raise yesterday and lots of praise from my director. A job I love. A beautiful house. Great food to cook with. Having the means to have utilities. Clean air and safe water. Being able to feel safe. My health most of the time (yeah f*** off menopause). Being able to clean my house. Reminds me that I’m lucky enough to have a cleaning lady but she is away this week hopefully having a fantastic southern vacation and hoping that she brings me back bacon fat. The chance to go away tomorrow for a few days to see the juniors, have a nice couple of meals, the guys to play golf and me and the daughter in law are off to a Pompeii exhibit. And I don’t have to cook or clean up! Books. Always books. Music. Loads of music. Ben and the others who came before him in providing a place to come when I’m sick or bored or need to vent or just want to goof off, and to those I find online. So many of my patrons and people around the world do not have even a fraction of what I have. I’m so very lucky and I always try to be thankful. I forget sometimes to be happy, but I try to be and do better every day. May you all have a truly wonderful, safe and happy Holiday season with your loved ones. A lovely feel good thread. I was all set to say I dread Thanksgiving...all the obligations and such. But reading your list made me happy for all the connections we have at this time of year. Gd for you, Cass. I like Thanksgiving. Christmas is a PITA. I have picked up two future son in laws (Send money please!!!!) and a beautiful girlfriend. I have a good job, good health and have more to be thankful for than most, and more than I have had in many years. OK....I am thankful to have had a beautiful Mum, who even though she died in 2010 I still think of every day, and hope she would be happy with the way I am living my life. I am thankful for my family, my home, my freedom, and the good fortune and good health to enjoy life. Like Cass, books and music. I am thankful to have a few good friends to have interesting conversations with, to share good times and bad, and maybe more importantly, to share laughter with. I am thankful to have learned the basics of the internet, which has allowed me to interact with some really lovely people over the years. 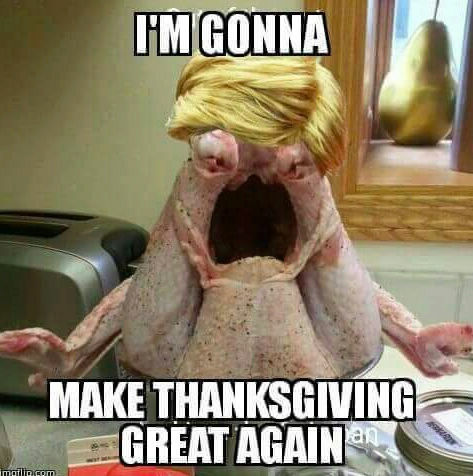 Finally, happy Thanksgiving to all our American friends for tomorrow. Thanksgiving always sounds fun to me. HoratioTarr wrote: Thanksgiving always sounds fun to me. It is. No hassle of present buying and I don’t do decorations so just cooking. And eating. Last year we went to visit son #2 at college and had Indian. This year we’re visiting son #1 and having Hawaiian/Asian fusion. Never had that before so should be interesting. When I was growing up my dad worked for a tv camera company. He used to score tickets for the television stands at the Macy’s Thanksgiving Parade. It included free hot chocolate and doughnuts. We would then go by Rockefeller center to see the tree and go ice skating. During the holiday period we went to Radio City Music Hall to see the Rockettes or Lincoln Center for The Nutcracker. It was a wonderful time. We’ve done Black Friday twice. It’s insane and crazy and never again. Syl wrote: OK....I am thankful to have had a beautiful Mum, who even though she died in 2010 I still think of every day, and hope she would be happy with the way I am living my life. As to your other post, I’m ignoring it lol. Maddog wrote: I like Thanksgiving. Christmas is a PITA. LOL. Good luck with the weddings. Should be some good games tomorrow. Cheers! Original Quill wrote: I was all set to say I dread Thanksgiving...all the obligations and such. But reading your list made me happy for all the connections we have at this time of year. Gd for you, Cass. I hope you have a happy day Quill. Go get some dim sum!